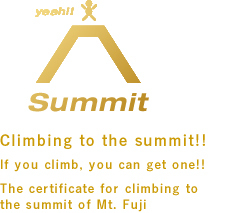 Let's get the a certificate for climbing to the summit of Mt.Fuji !! This is a servce for ordering of a certificate for climbing to the summit of Mt. Fuji. By accessing this website, noboru noboru FUJISAN and its contents, including the “Certificate for Climbing to the Summit of Mt. Fuji,” and the “Commemoration Letter for Climbing Mt. Fuji,” you are agreeing to be bound by the following terms set out by J-Bound Inc, outsourced to by Yamanashi Prefecture. Those who wish to be issued the certificates must agree to the following terms and conditions. If you do not agree with any of these terms, you are prohibited from accessing and using all of the services. The certificate, an official document approved by Japan Mt.Fuji Association, is a paid service for those who reach the summit of Mt. Fuji. 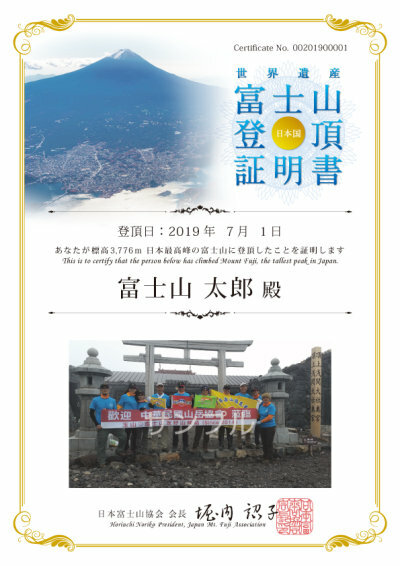 Eligibility for the certificate will be judged based on the picture submitted with the application form and will be endorsed by the Japan Mt.Fuji Association. We will issue a certificate to those who pass inspection. We cannot issue a certificate to those who clearly did not climb to the summit, or those who submit an unclear picture or do not have other evidence of reaching the summit. The certificate will be issued in accordance with the terms laid out by this company, but will be suspended if found in violation of the terms as laid out in this site, or in cases of failure to pay. Moreover, if any violations are discovered after the certificate is issued, you will be asked to return the certificate, and your fees and postage will not be returned except in certain circumstance. As for those who apply for the certificate, we may send information about our services and Mt. Fuji. We also prohibit selling the certificate to a third party. In the even of a natural disaster, or other reason, there may be changes, shortages or stoppages to the services, without notice. The contents of this site are also linked with various SNS. The rules of the SNS also apply to the rules listed on this site. Use at your own risk. It is prohibited to submit things that can cause harm or injury to others, or that go against the public order. In case a transgression is discovered, the services will be stopped, and depending on the contents, the subject matter may be reported to the authorities. Some of your personal information will be shared with an outside third party. In this case, appropriate measures will be taken to ensure that your personal information is not leaked. The personal information written on the form (postal code, address, name, telephone number, age and email address) will be managed by an outsourced contractor, and will be used for age verification, as well as to contact you in the case of your eligibility. Moreover, other personal information collected will be used for statistical purposes, and cannot be used to identify any individual. Within the limits listed above, our company may entrust your personal information with an outside third party company. In this case, appropriate measures will be taken to ensure that your personal information is not leaked. In addition, we follow the conventions established by the Japan Mt.Fuji Association regarding the privacy of your personal information.